In his incredible book False Impressions: The Hunt for Big-Time Art Fakes, Hoving (who, in case you couldn’t tell at this point, is kind of a hero of mine) briefly touches upon how forgeries tend to come in waves. There will be one huge turning point in any era that causes art to become incredibly popular, and suddenly forgeries pop up like nobody’s business. The Middle Ages had its relics, the Renaissance had its Classical Greek sculpture, and the nineteenth century had its objets d’art. Or tchothke, depending on your point of view. The theory for this is that the nineteenth century was all about the democratization of knowledge, including the arts. Museums were opened specifically in the hopes of educating the masses, and the emerging middle class spectrum now had expendable income to splurge on extravagances such as fancy Renaissance jeweled boxes, or ridiculously enameled cups that could not possibly be used for anything except to look at. 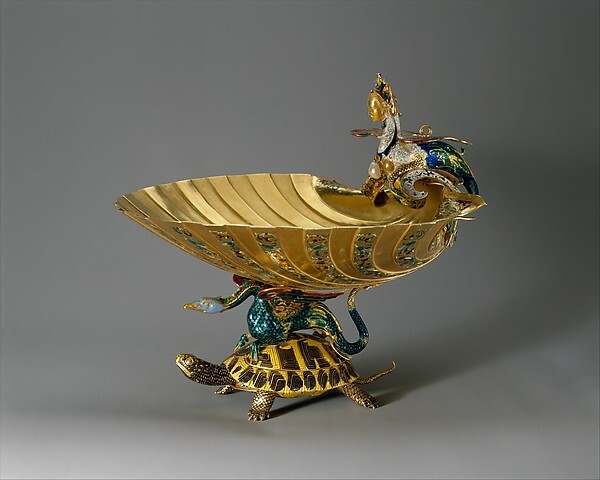 In 1913 Altman bequeathed the Rospigliosi Cup to the Metropolitan Museum of Art in New York. Although the former attribution to Cellini had been debunked in the 1960’s, it was still believed to be of the sixteenth century, by a Dutch craftsman who had worked in Florence. Of course Hoving got his hands on it during the 1970’s and concluded that something was off. The sphinx was almost to prim, the execution just a little too perfect and sterile. His gut told him something was wrong, but he didn’t say anything right away because the cup was considered a treasure of the museum. A few years later, (1978 to be precise) a young museum assistant at the V&A in London uncovered a huge cache of preparatory sketches and technical designs for objets d’art in the style of the High Renaissance, belong to a well known nineteenth century goldsmith Rheinhold Vasters. The sketches are very detailed, describing at length the manufacturing requirements for the works involved, and inevitably revealed the true origins of many High Renaissance treasures in internationally known collections, not just at the V&A itself but even the Linsky collection (you know, the guy who ran Swingline staplers). It was later revealed that Vasters was one of the craftsman employed by Frederic Spitzer, a well known con artist of the nineteenth century who fashioned himself into a powerful art collector that sold almost entirely fakes or knock-offs. NOTE: It was brought to my attention that I never specified whether the Rospigliosi Cup was found among the drawings by Vasters, thus proving Hoving’s gut reaction correct. Apologies for the confusion. The cup was indeed found among the drawings, thereby dating it to the nineteenth rather than the sixteenth century.